I was scrolling through the Pintrest app which has obviously aggregated information based on my **ahem** age and interests. Included in my feed is everything from “Trends That Older Women Definitely Should NOT Wear” to “Keto Casseroles for Rapid Weight Loss“. The other day I ran across “8 Weighted Chest Exercises to Blast Away Armpit Fat“. Now, I should have known better but hey, if there’s a way to blast fat I want to know about it. I’ve learned from almost ten years of experience in my own personal nutrition and fitness journey that you absolutely cannot target fat loss through specific exercises (although I still clicked the link). Yes, you can target areas to “improve the look of…” and burning calories in general can lead to weight loss, but you cannot blast away fat by targeting a fatty pocket on any area on the body. This last year has had its challenges for me. I’m an entrepreneur and have run a small business from my home office for 15 years. There have been ups and downs and the last couple of years have been transitional (rather than necessarily bad). I’ve had to adjust and adapt as the tech industry has changed. I’ve struggled to find the balance between my professional pursuits and creative passions. I’ve been scared, tired, stressed, lost sleep, discouraged and felt run down (or run over) at times. While I’d say I never totally crashed, my eating habits had gotten sloppy and my activity levels were less aggressive. I wasn’t feeling strongly motivated as I had in previous years. The result: armpit fat. Is it really just my armpits that got fat? When you’ve noticed that you’ve gained weight in one area whether it be armpits, back fat, belly, hips or thighs, you’ve actually gained fat pad all over your body. For some of us our body fat can be less evenly distributed so it’s easy to give hyper focus to a certain area. I don’t recall giving much thought to armpit fat…until recently. Once I finally coped with my entire, current reality I had to admit that my skirts aren’t as loose as they had been, there’s stuff rolling over the top of my jeans that didn’t used to be there…let’s just say that my armpits were giving the last cry for help. It was time for me to refocus my efforts. 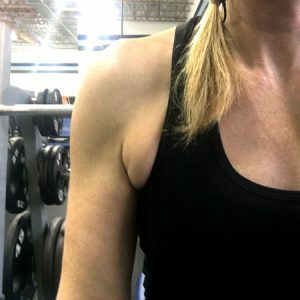 I was still working out fairly consistently lifting weights, cross training and doing cardio but it became obvious to me that it wasn’t enough to maintain where I wanted to be. Some might argue that perhaps my goals are too aggressive or that I’m fine, look great, and have nothing to worry about. However, I know what my journey has been. I know the standard I’ve set for myself and I know when I’m letting myself slip. Because my basic consistency in the gym wasn’t enough, I knew I needed to reign in how and what I was eating. It’s the little things you let slide here and there. For me, it happened over a long period of time. Eventually I got tired of grabbing, pinching and tucking “stuff” that wasn’t there before. I’ve decided to structure my nutrition for the next 5 weeks. I mean REALLY aggressively structure my nutrition while still nourishing my body and preserving my muscle. The plan is that it will result in fat loss ALL OVER MY BODY and we’ll just have to see how those armpits are doing 5 weeks from now. 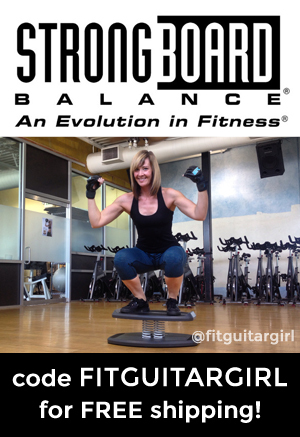 I will be sharing my journey through my Instagram account @fitguitargirl, on my private facebook group Team Transformation (request if you want to be added to the group) along with posts to my public Fit Guitar Girl facebook page. If you’d like to know more about my process feel free to get in touch! If you’d like to read more about my ORIGINAL weight loss journey back in 2009 click here.